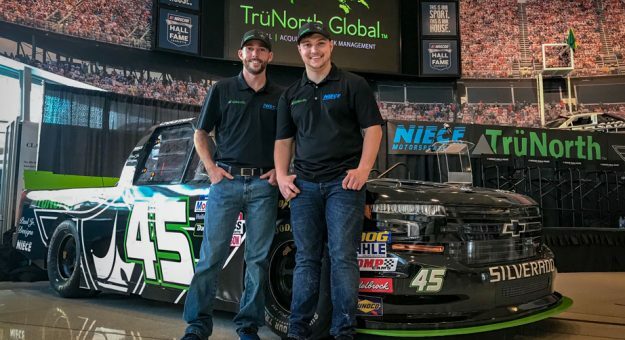 NASCAR Xfinity Series winner Ross Chastain will pilot the No. 45 TrüNorth Chevrolet Silverado for Niece Motorsports during the 2019 NASCAR Gander Outdoors Truck Series season-opening event at Daytona International Speedway. Chastain and Reid Wilson will share the No. 45 TrüNorth Chevrolet Silverado during the 2019 NGOTS season. The paint scheme that Chastain will run at Daytona was designed by Paul Teutul, Jr. of Paul Jr. Designs and star of “American Chopper,, in partnership with TrüNorth. Paul Jr. will be in attendance at the NGOTS event at Daytona International Speedway in February as the TrüNorth/Paul Jr. Designs No. 45 takes to the track. TrüNorth, the leading provider of commercial asset related warranty programs and services for dealers, fleets, owner-operators, and commercial finance companies, partnered with Paul Jr. to build the first TrüNorth™ custom bike, which was unveiled in early November at the UTA Convention in Orlando. That bike build will appear in the second episode of the new season of “American Chopper” on Discovery Channel in February. Additionally, Paul Jr. will build a second TrüNorth custom bike for the launch of a new brand from TrüNorth. This bike will be unveiled at Daytona in conjunction with the NGOTS race. Last season, Chastain made three starts with Niece Motorsports — at Bristol Motor Speedway, Texas Motor Speedway and Homestead-Miami Speedway — earning a best finish of 12th at Bristol Motor Speedway. Before moving into the NGOTS, Wilson competed in the NASCAR K&N Pro Series East, where he had a 50 percent top-10 rate. In 2018, he was named No. 46 in MotorsportsAnalytics.com’s ranking of the top 75 NASCAR Cup Series prospects. “Reid hasn’t competed regularly in a NASCAR ladder division, but when he does appear, he’s proven formidable,” stated David Smith, president of Motorsports Analytics. The NASCAR Gander Outdoors Truck Series season will kick off at Daytona International Speedway on Friday, Feb. 15.